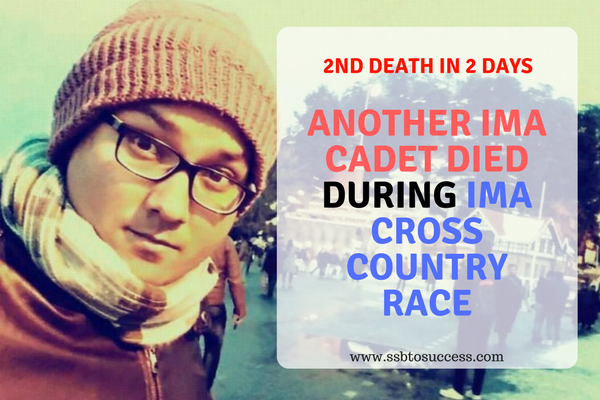 Soon after the news of Indian Military Academy Gentleman Cadet Deepak Sharma died of exhaustion during the 10 KM cross country race, one more death has been claimed by the authority. During the routine practice at IMA, 6 other cadets fainted which were rushed to a private hospital at Dehradun. Among those six cadets, one cadet has lost his life yesterday. The cadet is named as Navin Chhetri. The sources revealed that Navin Chhetri was 23 years old GC at IMA who joined the organization after completing his graduation from Bharati Vidyapeeth / Bharati Vidyapeeth Deemed University. he was the resident of Khaprel village in Darjeeling, situated in West Bengal. He pursued his schooling from Army Public School Sukhna. The situation occurred when the cadets were undergoing their regular routine cross country race of 10KM. During the race, 6 cadets fell unconscious. Along with that Cadet Deepak Sharma from Bathinda, died while reaching the hospital. Deepak Sharma was declared brought dead by the medical authority. However, other cadets were being given proper medication for recovery. According to the media sources, Chhetri fell unconscious during the routine race after which he was rushed to the military hospital. The sources at Hindustan Times stated, the Medical spokesperson Bhupendra Raturi mentioned that the GC was brought in a ventilator system. “The patient was unconscious and was brought on a life-support system. He was perhaps suffering from a kidney ailment. However, the post-mortem report could definitely reveal the reason behind his death,” he said. After the cadet died on Saturday night, the doctors performed post-mortem after which the body was handed over to the family. NOTE: The data is still can’t be purely verified as the IMA officials have remained incommunicable.